Eastern States is about to explode into action again at Van Cortlandt Park, and this year there is a definite flavor of Western States too as the nation's #2 team Claremont flies in from California to battle for the crown. Four-times reigning Eastern States champ Fayetteville-Manlius is switching to the letter races this year, but NY's #1 team Liverpool has its sights set on improving upon last year's 2nd place finish. 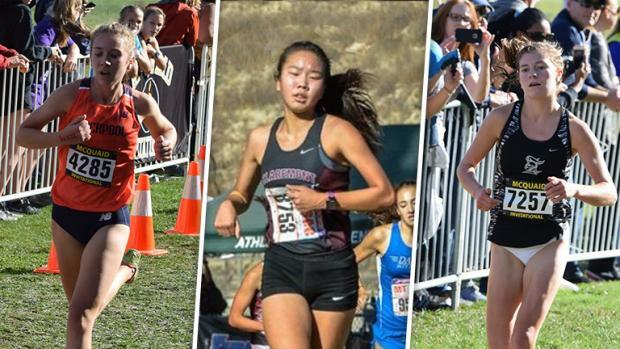 The field is deep this year behind the top two contenders, but the battle for the individual title may be the best in years as four runners sporting speed ratings over 140 will be leading the way, and there may be no clear favorite between Brooke Rauber, Jenna Schulz, Abby Loveys, and Alexa Westley. As always, the crowds will be popping some eardrums, the tee shirts will be screaming out the most profound thoughts ever thunk by a runner trying to crawl her way to the finish line, and unimaginable joy will be had by all. Can't be beat.